...You see, I've been considering going on a little spending freeze. I don't know what it would entail, I don't know what I would / wouldn't limit myself from, and I really don't think it would work out. However, I have been considering it, so at least that's one step in the right direction, right? But the problem is, fall is coming up and it is the most wonderful time of the year. If you don't feel this way, just pretend for a little bit to humor me. Back to the point though, spending freezes + fall fun / lust lists do not mix... So I had to come up with a solution. Cue blog friends like Leeann and opportunities such as this. I figured if I can't spend money on myself, I better enlist a few people to do it for me... So that's why I'm calling to YOU to hook a girl up. What a great way to make friends, right? Do a blog swap then pressure your audience to feel bad for you and ask them for presents... Classy. Really though, I'm sure if you all pulled together, you could grab these modestly priced items off of my fall lust list. And lucky for you, my birthday is in October, so you have an even better reason to start saving those pennies now. 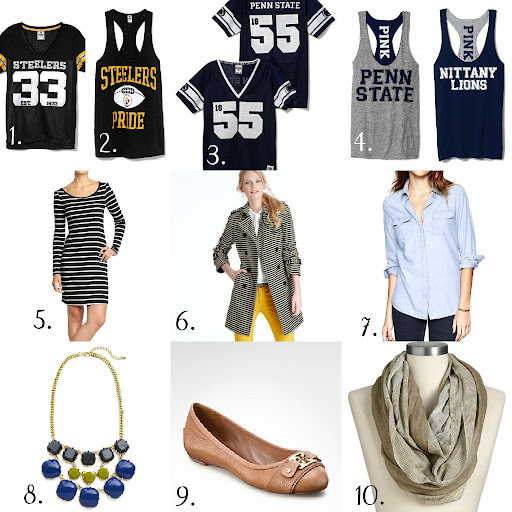 1 + 2 : First of all, I'll need this & this to fully showcase my affinity for the Pittsburgh Steelers. Love love love VS's NFL line. 5 + 10 : A one-stop-shop at Old Navy has me pining over this black and white striped dress and this infinity scarf... again, hooking you up by not making you run rampant. 6 : Next, how perfect is this trench? Lust. It's available online now and I'd probably take a medium or a large. 7 : Chambray Chambray Chambray - hey hey - get on it. 8 : Not to be outdone by the rest of my outfit, I will need (not want, need) a bauble or two (as if I don't have enough already) and the colors in this Charlotte necklace by Jeweliq scream fall. 9 : Last, but certainly not least I will not be spotted wearing high heels and boots, but rather flats, flats, and more flats. My feet would greatly appreciate these. Thank you in advance for taking care of this for me, the UPS guy will be so thrilled to carry all this up multiple flights of stairs in an elevator-less apartment complex + my fiance will be glad he doesn't have to worry about me draining our bank account a week after payday. Win - Win for all. Also thank you for forgiving my up-frontedness and my great friend-making skills. I promise I'm not this funny rude all the time. If you could, get your buns over to My Life, Laughs, & Love to not only see Leeann's post, but perhaps get to know me a little more! Thanks again for having me, girl - it's been fun! LOVE that striped dress - so cute! I really love the scarf.